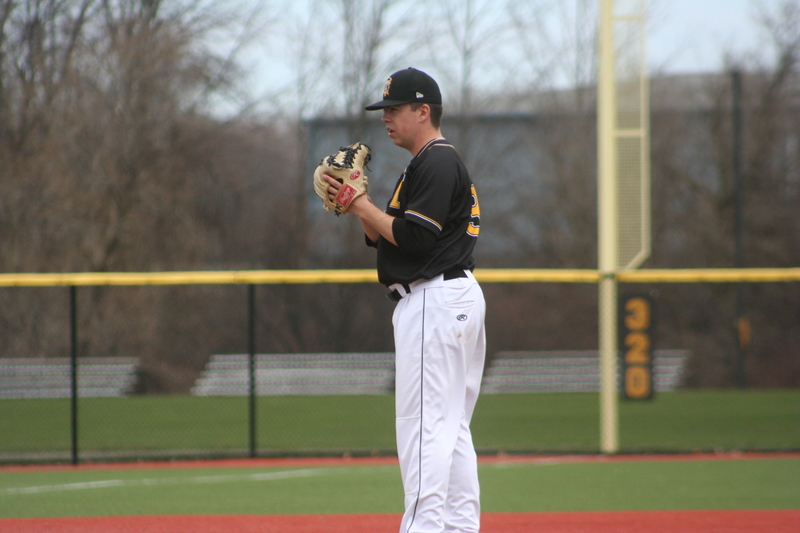 Stuart Martin has made 29 appearances out of the bullpen over two seasons with the Monroe Community College Tribunes. He picked up the first save of his career on May12th of this year. (Photo courtesy of Monroe Community College Athletic Communications). ENID, OK. — Dave Brust never saw it coming. With the Monroe Community College Tribunes clinging to a 9-6 lead in the sixth inning of Game 1 of the Region 3 Division II Championship, the fifth-year coach went to his bullpen. One run already crossed home plate in the inning, and the Mercyhurst NE Saints looked primed for a rally. Stuart Martin had other ideas. The sophomore right-hander escaped the sixth and allowed just one hit over four shutout innings. He struck out three, walked none and faced two over the limit to pick up the save …. the first save of his career. Twenty-four hours later, Martin hurled two more scoreless to notch save number two as Monroe clinched the regional title. “Two weeks ago, I could not have told you he was our closer,” Brust said. In that time, Martin has thrown nine shutout innings under the tightest of postseason circumstances. The Eden Mills, Ontario native has struck out 11, walked three and surrendered just four hits for a WHIP (walks + hits per inning) of 0.78. And he collected three saves while closing out one other game. Martin made 13 appearances on the mound in 2017 – all out of the bullpen. None resulted in a save. His first 12 trips to the mound in 2018 equalled the save number of saves. As MCC readies to take the field for the NJCAA DII World Series, the term lockdown could be suggested to describe Martin’s efforts. Getting to this point wasn’t a matter of chance. It took the sophomore hurler adding another pitch to his arsenal. Once the diagnosis was made, Martin went to work with assistant coach Cory Brownsten. He also went through a variety of grips trying to master the pitch during flat-ground sessions and in the bullpen. Once he developed a feel for the pitch, Brownsten suggested new locations and when to throw the pitch. Monroe (30-18) opens the NJCAA D2 World Series against Brunswick (29-22) of Region 10. A 5 PM EST first pitch is scheduled Saturday at David Allen Memorial Park.